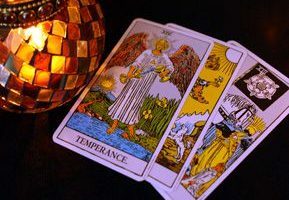 Tarot Journeying helps us connect with the power or quality in ourselves that is depicted or evoked within each of the 78 cards in a Tarot deck. It’s also a really good way of deepening our study of the deck as well as being an exciting adventure! You can journey using any one of the 22 major arcana or 56 minor arcana cards. The 22 major arcana cards each represent either an archetypal figure or an archetypal experience. An example of an archetypal figure would be The Empress, who is the mother of all things – encompassing literal motherhood but also the birth of new ideas or the inception of a business. The card is also ruled by Venus and The Empress is a representation of the Goddess Ishtar, so when you look at the Empress you are looking at a female who is all woman. 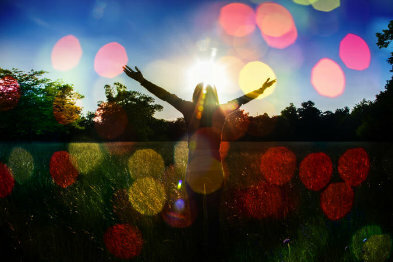 An archetypal experience is one that we will all encounter in our soul’s journey, such as those wonderful moments where everything comes together in a dance of completion and celebration as depicted in The World. 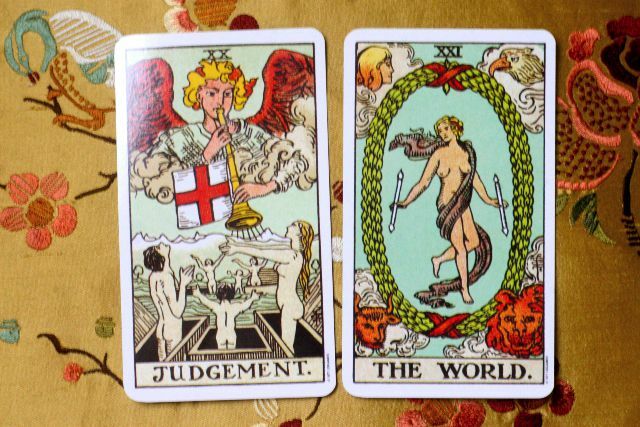 By their nature, archetypal figures or experiences pack a huge power, but there is no reason why you can’t journey with one of the minor arcana. Journeying with the Ace of Swords, for example, might be a really good thing to do if you want to sharpen your thinking, or journeying with the nine of pentacles might help you slow down if you’re the kind of person who rushes through life without taking the time to appreciate things! The steps to journeying are simple, but the results are profound. Sleep with the card under your pillow. Notice what happens in your dreams. Keep a dream journal to explore this more deeply. Meditate with the card pressed against your third eye. Notice what impressions, images, sensations or visions you get. Paint your own version of the card. Be as creative and expressive as you want to be. Place the card somewhere visible and safe, such as on a shelf or mantelpiece, where you can just look on it whenever you want and see all of the different qualities within it. If you already have your own home alter, you could put it there. If you don’t, you could very easily create one by putting together candles, crystals or anything else that has special significance for you in one space. Take yourself on a guided visualisation through the landscape of the card. Sit somewhere quiet where you won’t be disturbed. Close your eyes and relax. Visualise the card in front of you with the edges of the card like a window or doorway through which you can step into the land of the card itself. If there are any figures there, talk to them. You can ask them any question that you like. Ask them (respectfully) if you could make a connection between that part in you that resonates with the energy that they embody and that energy itself, if it is for your highest good and for the highest good of all. For example, you might ask The Emperor if he could help you connect with your own inner authority. Be prepared to accept a no for an answer, although it is fine to again respectfully ask why. The figure may tell you of something that you need to do first, or suggest that you need to work with a different energy that hadn’t occurred to you. If it’s okay, allow yourself to receive whatever energy the card is projecting. You will know when it’s time to finish. Always remember to thank the figure or the card itself before leaving its landscape and returning to your own present. Brings yourself back and write as much as you can fully remember about the experience in your journal. Over the next few days, weeks or months, notice if you are feeling or behaving differently. Tarot journeying can be a life changing experience, and that means you have to give each card a chance to change your life. You can do as many as you like, but don’t try and connect with more than one card at any one time and leave at least a week in between guided visualisations. And always remember that the power you are evoking lies in you. Card number one of the Major Arcana might be the archetypal Magician, but you are the magician in your own life. I would love to hear some of your stories about Tarot Journeying! If you’ve been longing to learn the tarot but have felt too daunted by the sheer weight of information out there, don’t worry. What the experts don’t tell you is that learning the Tarot can be very easy. What books should be in your Tarot library? Whether you’re just starting out or already giving professional Tarot readings, what books on Tarot should be on your shelves?